Tim Mahoney seems totally comfortable with his talent, not needing to break molds or reinvent things. His new CD has a couple too many songs, but a whole bunch of it is sparkling, radio-friendly pop-rock. Hmm, “radio-friendly” – does anyone discover new music on the radio anymore? I don’t think so. What, then, is the fate of sunny pop music, even finely crafted sunny pop music like this? Maybe I’m jaded from living on the East Coast. Maybe in some places people still do get their music from mainstream radio. I might be just an out-of-touch windbag. Probably am. Anyway, because he is an indie, Tim Mahoney mostly gets left out of the bleeding stump of the commercial radio scene (though a couple of stations have spun a track or two). And without that, how do “hit-worthy” songs become hits? It’s a tough one, kids. Is it just me, or are there fewer hit songs these days, even as we have more and more music to choose from? his Myspace page. You probably won’t be sorry, and if you are, well, how much did you pay to read this review? Give me a break. Lez Zeppelin is just what you’d think: an all-female Led Zeppelin cover band. As gimmicks go, it’s not a bad one. Known for an energetic live show, the band has now put out its first CD, produced by legendary engineer and frequent Zep helmsman Eddie Kramer. The disc has six Zeppelin classics, plus two original instrumentals that evoke the Zeppelin style, one a riff-rocker, the other an acoustic trip featuring bassist Lisa Brigantino on mandolin. There is, however, a sterile quality to the recording. The parts are all there, but the drums sound hollow, the guitars too shiny and perfectly balanced. I’m no audio engineer, but I can recognize when a studio recording just sounds, somehow, “cold.” So the CD works better as an advertisement to go see the band than as a self-contained listen. 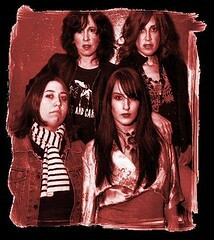 The tracks that succeed best, sound-wise, are “Winter Sun,” an original, and the long songs “Kashmir” and “Since I’ve Been Loving You.” Perhaps because they allow for more open space, these tracks seem to have encouraged the women of Lez Zeppelin to put more meat on the bones of the music, with McLellan even grafting a little Janis Joplin into her Plant. Speechless makes a moderately complex form of prog-rock that combines a cinematic outlook with a fusion-influenced feel, though heavy, distorted guitars make some notable appearances. Imagine Jethro Tull’s instrumental interludes expanded into full-length mini-suites and performed by Emerson Lake and Palmer plus Steve Howe on guitar, and you might get tracks like “Stella” and “The Big Majestic.” Quieter stuff like “Thank You” suggests Vangelis moonlighting in a smooth-jazz band, with even a hint of Billy Cobham atmospherics, while the triumphal, nearly nine-minute “Vader’s Boogie” closes the CD with a satisfyingly crunchy evocation of Star Wars villainy crossed with classical-influenced scale motifs that made me immediately think of Tull’s Thick as a Brick album. Brain-massaging and accessible, Time Out of Mind is a 50-minute wash of musical good feeling. Who needs a singer? Listen to some full tracks at their Myspace page; hear extended clips and buy the CD at CD Baby. Another set of instrumental yumminess comes out of famous busybody Aaron Comess‘s studio in the Catskills. The Spin Doctors drummer backs up Fender Rhodes whiz Pat Daugherty in this funky, volcanic, supremely interactive jazz trio. The third member is the excellent bassist Tim Givens, who, as noted on the band’s website, is also the maintenance man for Daugherty’s Rhodes – a highly valuable skill. And because the Fender Rhodes, like the Hammond B-3 organ, is also a monster to cart around, you hear it far less than its unique and versatile musicality deserves. This CD is a good argument for more Rhodes in the world. Here’s a sample from NYEP’s new disc. Their Myspace page also has some tracks from their earlier releases. This entry was posted on Monday, July 16th, 2007 at 12:43 pm	and is filed under Music. You can follow any responses to this entry through the RSS 2.0 feed. You can skip to the end and leave a response. Pinging is currently not allowed.